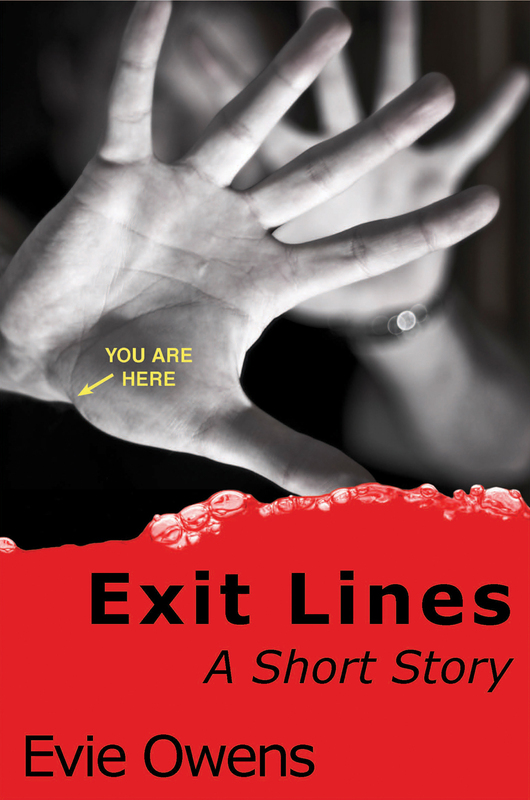 Now available for the Nook on Barnes & Noble.com and for the Kindle on Amazon.com, Exit Lines: A Short Story. About serial killers. And love. Kidding! Shawn’s family never took a vacation before. Why did they have to wait until she turned 15? “Why do I have to spend my entire summer in the backseat with you! ?” she says, glaring at Katie. Shawn leans back and shoves her knees harder into the back of her mother’s seat. Her mother shifts a little bit but doesn’t say anything. “Grow up!” Katie whispers, then turns away, looking out the window. She has a pencil and a pad of paper on her lap. She is trying to spot a license plate from all 48 contiguous states. Her mother finally turns around but Shawn pretends not to notice. She can see her sister’s smile reflected in the window. It’s like looking over her own shoulder. He watches the bodies flash by. Shoulders and legs, necks and arms, in smooth creamy shades of beige and brown. It is late in the day and the last show at the dolphin tank is halfway through. He rode the conveyor belt through the Shark Experience earlier but it only annoyed him. The girl walks by again. She has short blonde hair and a triangular face. She is wearing blue and white polk-a-dot shorts and a white sleeveless blouse. Tan leather sandals embrace her slim feet. He has seen her go by twice, trailing behind a tall blonde man and a small thin woman with light brown hair cut bluntly at her sharp jawline. There is a younger girl, too, with hair just like the older one’s. The older girl’s face, as she walks slowly along, is a sullen mask of disinterest. She reaches out and plucks at things along the way without looking. Stuffed killer whales clipped to a string like a fisherman’s catch. Dolphin golf caps with fake bottlenoses sewn obscenely to the front. The man and woman stop in front of the schedule posted outside the dolphin tank. They are arguing. The two girls look at each other and shake their heads. Finally the woman takes a few steps away, then turns to see if her brood is following. The man throws his hands in the air and walks over to join her. The younger girl goes too, but the older girl stands her ground. Her hands move like mating fish at her waist, flirting with the belt loops. The woman shakes her head no and the girl looks away, refusing to see. The man touches the woman on the shoulder and says something. Finally the woman sticks out her skinny arm and points at her gold watch, jabbing at the crystal with a pointed peach-colored nail, then she points at the ground under her feet. The girl nods and the other three walk away. The younger girl turns and waves goodbye. When the older girl waves back, he is standing behind her. He can tell from the curve of her cheek that she is smiling. Took a while, for one reason and another, but Blood and Guilt is now available on Barnes and Noble as well. In other news, my Contest Initiative continues apace, and I'm thisclose to posting a new short story to both Amazon and Barnes and Noble. Now that I know how, it's going up on both at the same time.